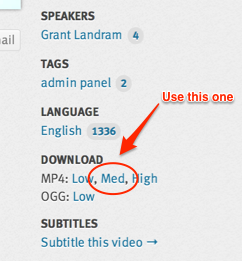 To contribute subtitles, you must be a registered user at the WordPress.org website. Note that this is the username you use to log in at WordPress.org, not the username you use to log in on your own WordPress-powered site. If you think you are registered but aren't sure, you can try logging in at login.WordPress.org. If you don't have a WordPress.org username yet, you can sign up for a free account. 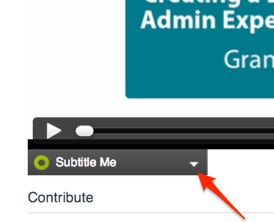 Adding captions or translations is a great way to take your favorite WordPress.tv video and share it with an even broader audience! It is easy to help us with this goal by submitting a caption or translation file for your favorite video. Just follow the steps below! The tools at Amara.org will help you to create your caption or translation file. So before you begin, be sure to sign up for a free account on Amara.org. In addition to helping you create a caption file, the tools at Amara.org also allow you to stop and start again in the middle of the captioning process. That way if you get interrupted, you can save your subtitles and pick up where you left off. Locate the “Med” link in the Download section of the sidebar. 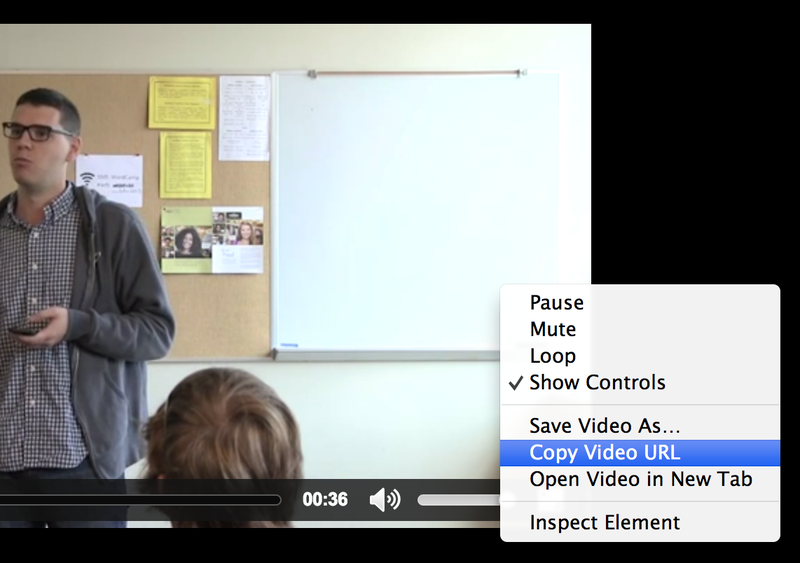 Right-click on that link and select the option that will copy the video URL. Each browser has slightly different terminology for this. Yours may say “Copy Link”, “Copy Link Address”, “Copy Link Location”, or something similar. Go to http://www.amara.org/en/videos/create/ and enter the video URL you copied from WordPress.tv. Once the video is subtitled at Amara.org, click on the link under View Subtitles, to the left of the video display. 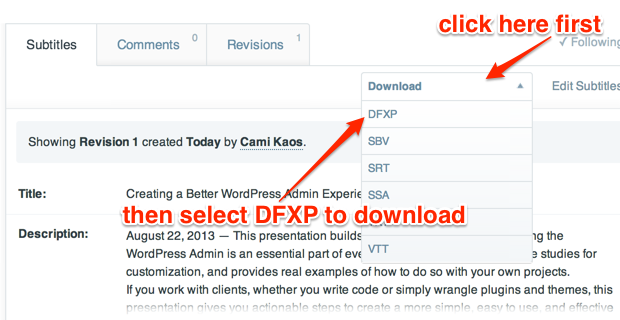 Next click on the Download drop-down menu and select DFXP format. 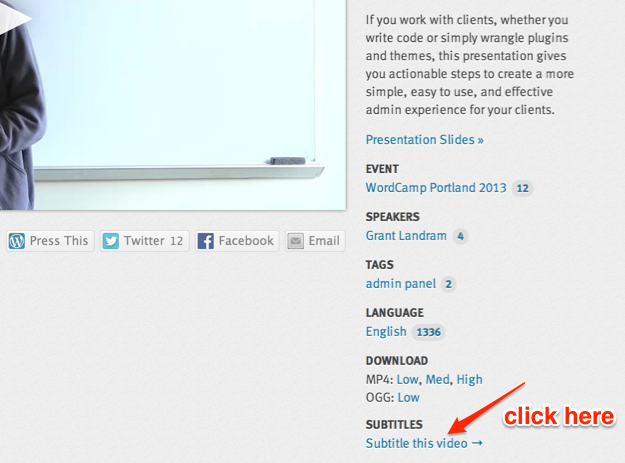 Return to the WordPress.tv video page, and click on the “Subtitle this video” button at the bottom of the sidebar. On the next page, choose your file for upload, select your language from the drop-down selector, and then click Submit button. In cases where there is already a caption file uploaded to a video, you do not need to use Amara at all, as it is usually much easier to translate the existing file instead. Load the page for the video you would like to add a translation for. 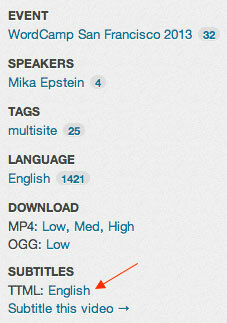 You can find the TTML link under the Subtitles section of the video information sidebar. Download the existing caption file and then open it in a simple text-editor like Notepad or TextEdit. Avoid using applications like Word or Dreamweaver, because they will distort the TTML markup. 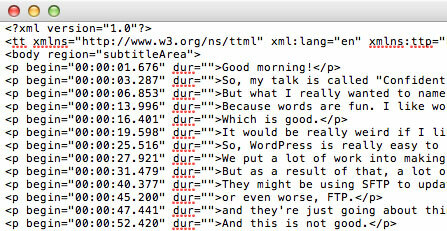 Inside the downloaded file, you’ll see the speaker’s words surrounded by <p> and </p> tags. Translate all of the speaker’s words into your language, but be careful not to change the surrounding <p> tags at all. Locate xml:lang=”en” near the top of the TTML document, and change the two letter language abbreviation to the language you are translating the file into. 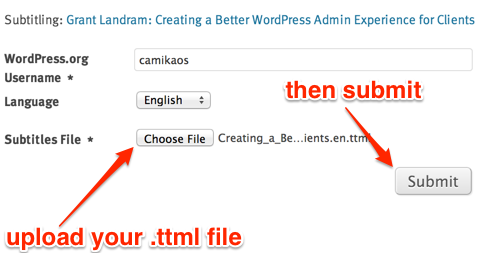 When you’re finished, save the file—being sure to use the original TTML file extension—and return to the WordPress.tv video page, then click on the “Subtitle this video” button at the bottom of the sidebar.